Heading outdoors to do a little skiing or snowboarding? Great! The exercise you get could help your heart, lungs, and immune system stay healthy. But before you step out into the winter sun and snow, make sure you follow this health advice: wear some sunscreen! In recent health news, researchers wanted to find out how many adults heed the advice to wear sunscreen with an SPF (sun protection factor) of 15 or higher when outdoors in the winter. A survey was conducted with 4,837 adult skiers and snowboarders at 28 ski areas in western North America. The survey participants reported their use of sunscreen, its SPF, the time of first application, and the time of reapplication. What the researchers found was telling. Only 4.4% of adults were in full compliance with all sunscreen advice aimed at preventing skin cancer. Half did comply with the advice to use SPF 15 or higher. Of those wearing sunscreen, 73% applied the sunscreen 30 minutes before beginning to ski/snowboard, but only 20% complied with the advice to reapply it every two hours. The researchers concluded that although the recommendation to use sunscreen with an SPF 15 or higher has reached many adults, most people don’t follow the reapplication advice. To best protect your skin from harmful UV rays, apply sunscreen up to 30 minutes before sun exposure, and reapply it every two hours, no matter what the season. Find out how this herbal cream could help protect you from skin cancer. 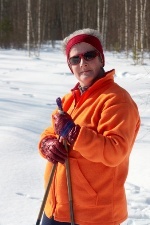 Buller, D.B., et al., “Compliance with sunscreen advice in a survey of adults engaged in outdoor winter recreation at high-elevation ski areas,” J Am Acad Dermatol. January 2012; 66(1): 63–70.